BABA is still one of the most popular tech stocks in the world as it is Jack Ma's company. The stock has been meandering higher as time goes by. Will this stock continue to make new highs? The key word here is "meandering" higher. Some stocks like BABA and Facebook does have a tendency to meander higher. They do not shoot up in a nice uptrend as many would like them to do. But they drift higher. Going up and then correcting and then going up again. The process repeats itself but over the long term, their stock continues to trend higher. This is the type of tech stocks that you need to invest rather than trade. In the event they drop to the rising 50 MA or the 200 MA, you can consider to add to your position. 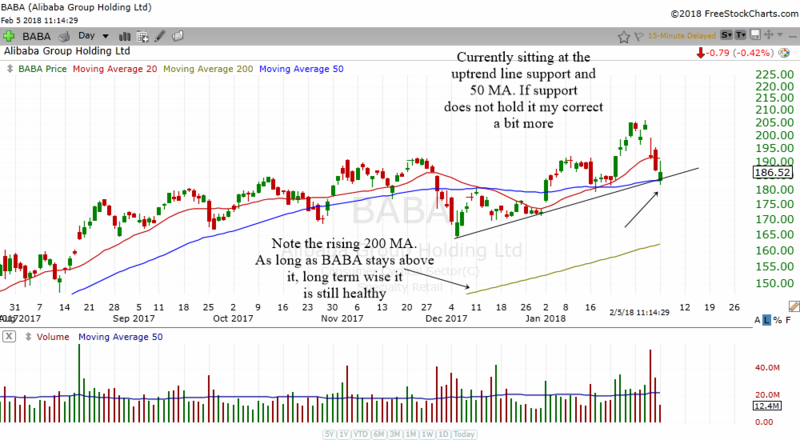 The chart above is the daily chart of BABA. As you can see, BABA is truly the type of stocks that make investors oscillate from happiness to frustration. It grinds higher, going up a week or two and then decline a week or two only to rise again. But this is a great stock for swing traders who like to catch the swings. Overall, the stock is still trending up. The rising 200 MA still points to a good long term health for this stock. Therefore, the patient investor should still remain bullish on BABA as long as the stock is above its rising 200 MA. Currently the stock has once again corrected to its rising 50 MA. It is also sitting at an uptrend line support. Perhaps BABA may bounce up from here. In the even the support cannot hold, then BABA will have more correction. It is always a good idea to look at the long term picture of a company's stock. I think Jack Ma certainly believes in looking at the long term instead of worrying about daily gyrations that his stock goes through. For the long term investor, the stock is still in a very healthy long term uptrend and therefore the investor should stay bullish on this stock. I have drawn the support area on the chart. 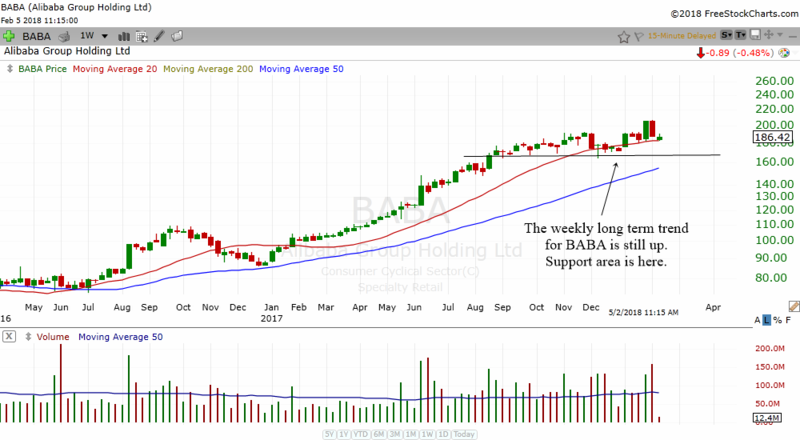 As long as BABA stays above this support area, it might just consolidate and breakout higher in the future.